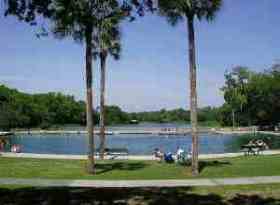 De Leon Springs State park Florida! Enjoy swimming in the 72 degree spring! It says back in history the springs had become a winter resort, and tourists were promised "A fountain of youth impregnated with a deliciously healthy combination of soda and sulphur". All we can say is, it's a beautiful park with shady picnic areas, a popular restaurant, swimming for all ages in 72 degree waters, hiking trails, boating, creeks and marshes spread around a huge 18,000 acres of park land here in Cental Florida. Although De Leon Springs State park does not have camping facilities, other activities include boat tours, canoeing & kayaking, fishing, scuba diving, snorkeling, wildlife viewing, bird watching and a great playground. The park is open 365 days a year from 8am to sunset. See links below for further details. Entrance Fees (2011): $5.00 per vehicle 2-8 people per vehicle...$4.00 single occupant vehicle...$2.00 pedestrians, bicyclists etc...$4.00 per hour. Concession & Restaurant: Old Spanish Sugar Mill Restaurant, open 9:00 a.m. - 5:00 p.m. on weekdays and 8:00 a.m. - 5:00 p.m. on weekends and holidays, serving until 4:00 p.m. Call 386.985.5644 for further information & reservations. Picnic Pavilion Rental Fees: $45.00 per day, plus tax: Rental of small picnic pavilion. $75.00 per day, plus tax: Rental of large picnic pavilion. De Leon Springs State Park has four pavilions. Another popular venue with tourist's and locals. Located around a 75min drive from Orlando, vehicles are required. We will keep updating this page via our RSS feed. regarding new additions, changes etc, so click onto the RSS feed above and follow the instructions to keep you on top off what's happening in and around Orlando, including updates for De Leon Springs Park.